Taking the Long Way Home: I'm Grateful for Running Bargains! 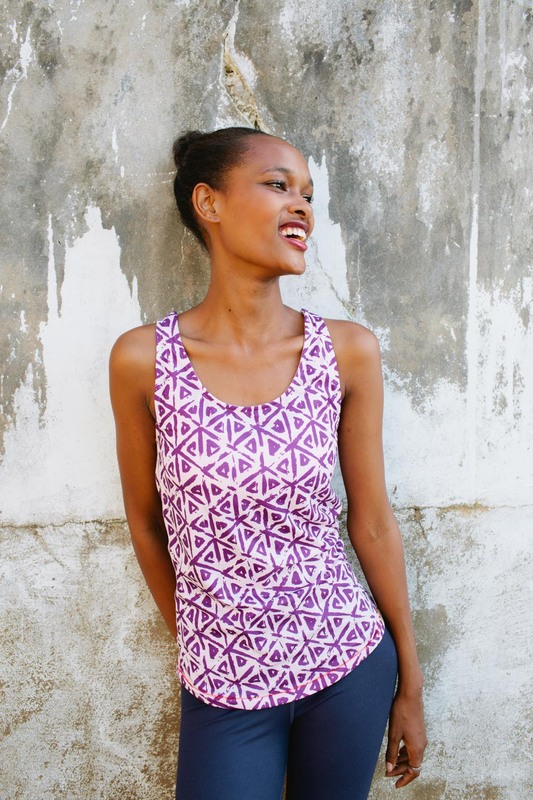 Janji, a performance running apparel company, was founded to help bring clean water to impoverished countries. Purchase this Nyali tank and give one year of clean water to an individual in Kenya. Use the code Janji5off to save $5 on any purchase. I've shared a few products from SLS3 here on the blog. I've trialed their compression socks (love them), the HiPZipp (got me through 2 marathons), the cutest ever bike shorts (pink flowers! ), and my new love, their low compression socks. I'm excited to share a 50% off discount code on the entire website! 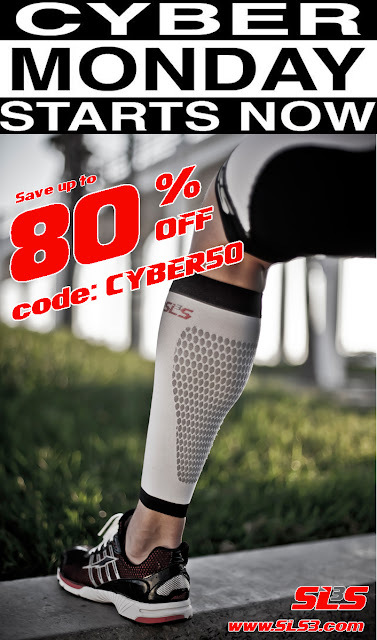 Don't wait tho, the code CYBER50 is good only 11/24 through 11/28. As I always say, it's never too late to jump into the Book Club! I would be remiss if I didn't mention some excellent book deals, perfect for the runner in your life (you!) Some of the books we've read for the Book Club are available for a bargain on Amazon.com. Do you have a Kindle reader? That's the way to go. You know the app is free, right? Fast Girl by Suzy Favor Hamilton available for $1.99. Boston Bound by Elisabeth Clor for $4.99. 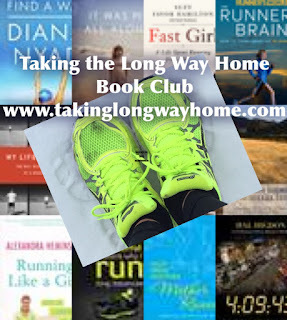 Confessions of An Unlikely Runner by Dana Ayers for $2.99. The Long Run by Mishka Shubaly for $1.99. Tales From Another Mother Runner by Dimity McDowell and Sarah Bowen Shea for $6.49. Happy Thanksgiving! 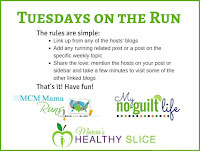 I'm thankful for all the runners who read my blog! Are you running a Turkey Trot this year? Any fun running bargains you want to share? Do you shop for your family this time of year? Or do you scoop up bargains for yourself? 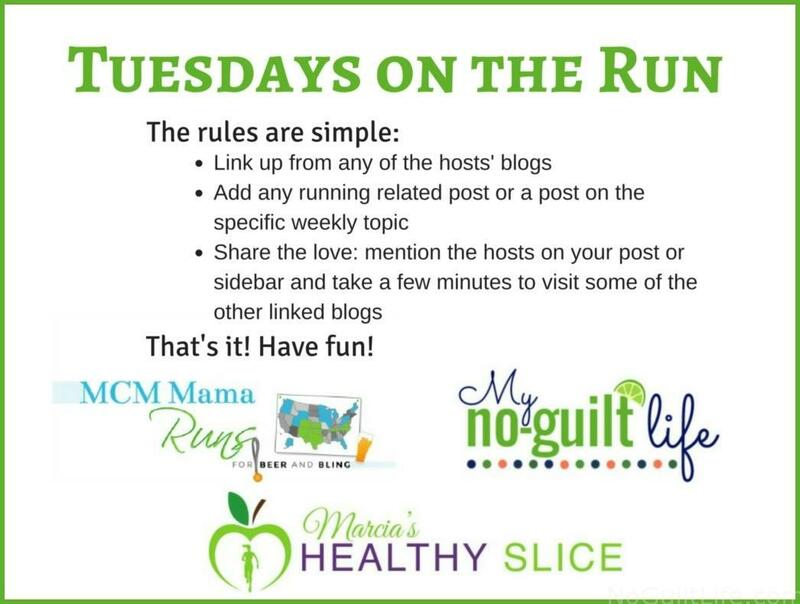 I'm linking up a day late and a dollar short with Tuesdays on the Run: Marcia, Erica, and Patti! Also with DebRuns for Wednesday Word, which is grateful. And with Debbie, Lora, Rachel, and Susie for Coaches Corner! Funny story I just have to tell: The Moji rep sits in the sauna with me. Well not WITH me, but he's in there and we talk massage. Haha! I saw they were based in LZ and contacted them for a discount code. Crickets. Good thing I like their product so much! It's really my favorite thing! Tailwind has been a game changer for me. I think the only Cyber Monday shopping I did last year was for myself! There were deals on Nuun and ProCompression holiday socks I couldn't resist! I hope you have a great day with your family. I've been shopping already! I love all the bargains this time of year. Happy TG to you too! Bargains aplenty! 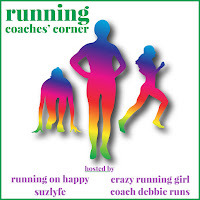 I'm going to have to check out some of the sites and see what's there ;-) We have a local Turkey Trot (in my 'hood), but it's doubtful I'll be running in it... but I will be there with my walking stride on (26.2 recovery is a _itch LOL). I don't do a lot of Christmas shopping these days.....the kids all want gift cards (but I still like the Black Friday hoopla). I work on Black Friday but I"m not much of a shopper anyways. I'll hit up all the websites for Cyber Monday. Happy Thanksgiving! The foot massager looks nice and I bet feel great! Happy Thanksgiving! Those are great deals for those kindle books. Does that work for an Apple ipad too? Or do they have their own book reader? I do not normally download books, I'm old school. Yes, I read them on my iPad using the Kindle reader app. The Amazon kindle store has great instructions how to download it. I like reading on my iPad. You can adjust the text size (no reading glasses needed!) and you can highlight key passages, saving them for later. I read your introduction and thought "yes, that is exactly what thanksgiving is about ... Turkey trots!" I'm running one tomorrow and trying to convince family to do a second one on Friday... We only have thanksgiving once a year! Happy Thanksgiving to you and your family Wendy! I'm thankful for your blog! I'm thankful that you read my blog! :p Happy Thanksgiving and have fun at your trot tomorrow! Thanks for all the bargains! Especially for reminding me that i have a discount code for Janji, and the Amazon deals on the books. Going there right now! Happy thanksgiving, Wendy! That foot massager looks like the truth!! Love me some Tailwinds....thanks for the reminder-time to restock! That foot massager is the truth--my mileage lately seems to think so! Turkey trot just sounds so messy! Like someone didn't cook the turkey all the way through, or something. Happy Thanksgiving!! I wish we had Thanksgiving when you guys do. I don't like having it in October. I keep forgetting you are Canadian! Do you guys Turkey Trot? I love a good sale!! I usually stick to online shopping because Black Friday shopping is a bit crazy for me! The only thing on my christmas list this year is running gear- shoes, clothes, & cold weather accessories! I'm an online shopper too. I don't like the crowds. Great collection of discounts! I keep hearing about Tailwind and how awesome it is, so I'd like to try it very soon. I am indeed running a Turkey Trot tomorrow and am anxiously checking the hourly weather forecast. =) Happy Thanksgiving to you and your loved ones, Wendy! I think it's supposed to be nice tomorrow! Anything beats what we've got now. Love love love the Goji Foot Pro and great compression socks! I wore those for awhile. Great list! Happy Turkey day! No turkey trot this year - hopping on the bikes. My 84 year old father-in-law is going for a PR at the Mexico Beach Turkey Trot though! He got his first GPS sport watch and it's so fun to see him still going strong. Oh how fun! I love that and want to be that 84 year old someday. Goals. Who doesn't love a bargain. I rarely buy anything if it's not on sale. I am running both a 10k and a 5k on Thanksgiving. Hope the weather cooperates. I hope the weather is good for you too! Have a fun day! I just adore this time of the year so much because everyone is so much happier - perhaps because everything is on sale? LOL! These are awesome! I'm hoping to get a really good deal on a Garmin this weekend. Mine died a few weeks ago and I feel so lost without it! I got a new Garmin for my birthday in September and all I can say is why did I wait so long? I hope you get one! Great discounts Wendy! 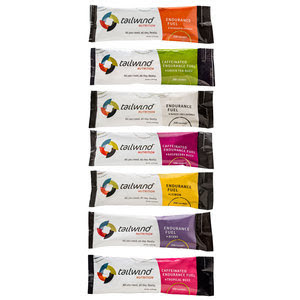 I am going to check out the Tailwind--I have always used Cliff Bar shots but they upset my stomach this past marathon-- thanks for sharing and Happy Thanksgiving! I think you'll love the Tailwind! I'm trying to get some christmas shopping done early so these are great ideas! I love all the bargains this year! I'm not turkey trotting this year either. There are a number around here, but most of my friends are out of town, so I just decided to bypass. There's a fun 12k here the weekend after, so I'm going to go with that. Thanks for sharing the bargains! I tend to shop for everyone this time of year - myself and those I need to buy Christmas presents for. If I can get a deal - all the better! Happy Thanksgiving Wendy! Happy Thanksgiving! I love all the bargains, but I usually end up shopping for myself! Yes! First year not going out shopping and I'm bummed only because the barre studio that opens next week that I already got a membership to is doing a bunch of really cool stuff for Black Friday. Maybe I just need to order that foot massager and call it good. Haha! I have to work all day Friday, so I will need a massage...not just my feet! Great deals! Hope you have a happy thanksgiving! I have a 5k in the am and then dinner at a friends! Sounds like a perfect day! Enjoy! It's pretty sweet! I love it. i could totally use a foot massager. Who couldn't? You should gift yourself! A year's worth of water??!! Wow. Great cause. 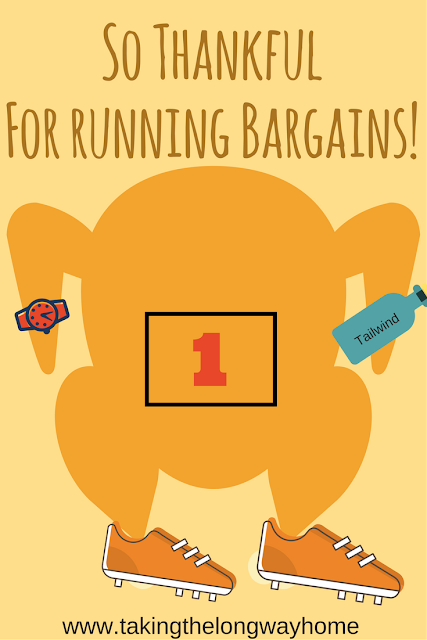 Enjoy your run and your Thanksgiving! It's really a great company. I have some packets of Tailwind that I bought and really need to try because I don't like the new version of my usual electrolyte drink. Maybe I should try it tomorrow to know if I should order more LOL. Tailwind almost never has sales, so this is pretty cool! I need a foot massager. Ok maybe it's more of a want but still. Thanks for the heads up on the deal. I wanted this foot massager but wouldn't buy it. I'm so glad I have it now! Thanks for the bargain tips, and I think all of us will be buying that foot massager! I need to check out Tailwind. I definitely don't fuel properly, and simply ran out of steam the back half of this year's marathon. I'm doing a trot this morning with my son and his fiance. He'll break 22 and she's never run, so I'll probably stick with her for a walk/run. Have a great Thanksgiving! I think you'd love the Tailwind! Good luck at your trot! No Turkey Trots in France.... I haven't even thought about Christmas either. I am usually such an obsessive anticipator that my shopping is usually done by December 1st. This year ? I haven't even thought about it, much less started. I've heard good things about GenUCAN to--but I've been so happy with the Tailwind that I haven't felt the need to try anything else! I never thought of putting my Moji foot massager in the freezer - thanks for the tip! And of course, thanks for linking up!